This week the City of Toronto has opened the doors to a public consultation about potential regulations for short-term home sharing ventures. Given that Airbnb is the biggest player in this new and emerging segment of the economy, a lot of the focus is on that company and its impact on Toronto’s long-term rental market. In a report published last month, we found tremendous growth in Airbnb listings activity: 288 per cent since December 2013. Airbnb bills itself as a way for homeowners to share their home to earn a modest amount of extra income for things like home renovations or travel. But we found that a lion’s share of listings belonged to the entire home or apartment category (64%) and a sizeable fraction of total revenues came from commercial hosts (46%) between December 2013 and July 2016. These estimates raised a red flag with respect to the risk Airbnb poses to the housing supply in Toronto. Several other research studies have also raised concerns with respect to the impact of Airbnb short-term rentals on the housing markets of cities across the world — prompting regulation to protect local housing stocks. While we agree with Airbnb that their platform likely reduces housing stock, we have some reservations about the methodology in its report on its activity in Toronto. For instance, the analysis and key findings in the Airbnb report compare entire home listings to the total housing stock (1,107,851) as opposed to the rental stock in Toronto (88,143). When the rental stock is used, the data tells a different, and more relevant, story. The table below compares entire home listings as a percentage of the overall housing stock versus the rental stock in Toronto, the impact of entire listings are not so “minuscule” after all: they actually represent at minimum approximately 11% of Toronto’s rental supply — and this is after only three years of Airbnb operating in Toronto. The Airbnb report states that a majority of entire home listings are offered for less than half the year. The company calls this “occasional” hosting activity and attributes it to primary residences being listed when the host is away without supporting this theory with data. We have a contention about this analysis and we know that most families do not have six months of vacation per year. But there is another potential economic explanation. Similar to demand for hotels and motels, the demand for listings on Airbnb peak during weekends, long weekends, and holidays. These high demand times also allow hosts to charge a higher price per night, making it more profitable to list during these times. But it’s still hard to categorize this activity as “occasional”. Airbnb has not only been selective about the interpretation of its results but also with the use of its data. They used median earnings across entire home listings to claim that a typical entire home listing generated $6,650 ($550 per month) from Oct. 1, 2015 to Oct. 1, 2016. But when you look at Airbnb’s data on average earnings, the earnings almost double: $ 11,420 ($952 per month). This implies that being a host on Airbnb generates almost as much monthly income as a long-term rental. That may not be what the company wants regulators to focus on, but it is an important consideration for regulators tasked with preserving the long-term rental housing stock in Toronto. 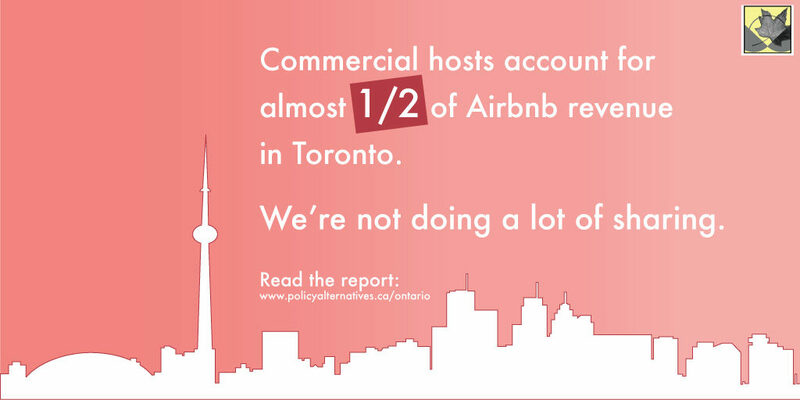 In short, Airbnb itself is acknowledging that its activity is starting to eat into Toronto’s rental market. It is attempting to minimize the problem, but we have to remember that these are early days for this new platform and as the company continues to grow, so will the problem. And that is the task of regulators to address, sooner rather than later.
? Toronto city budget cuts: Out of the mouths of babes?